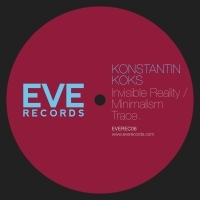 Konstantin Koks returns to Eve for his second E.P. Invisible Reality journeys from its dark intro through a miriad of sounds and emotions continually punctuated by hypnotic grooves and occasional vocal samples. Minimalism Trace hooks in the listener from the first kick developing quickly into an audio collage of perfectly placed samples and melodies nestling comfortably over the groove. 'Invisible Reality / Minimalism Trace' is available now from Beatport and iTunes.